Oftentimes, people ask me, “What is the purpose of felt food? What do people do with it?” My answer is simple: I make felt food with the intention of it being toys for children and pretend play. But then occasionally, I’ll meet a customer who buys them for other reasons. 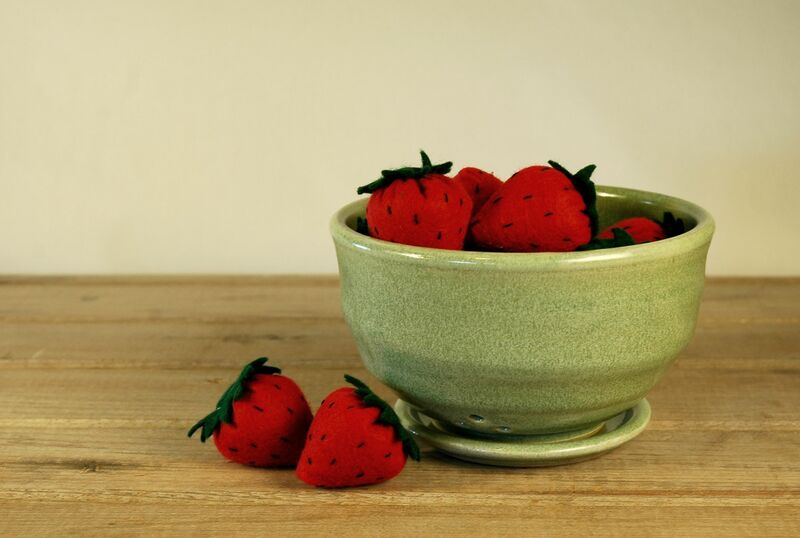 Recently, a customer told me they purchased my felt strawberries to help display her handcrafted “berry bowls” at craft fairs. I loved this idea, and I freaked out a little when she sent me this beautiful picture. You should check her out: Rebecca with Willow Avenue Pottery. This entry was posted in I Really Love Felt and tagged berry bowls, craft fairs, felt fruit, felt strawberries, Love of Felt, pottery displays. Oh, I love felted food. That bowl display is adorable!